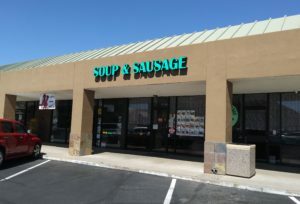 Soup and Sausage, an unassuming bistro located in a strip mall on the southwest corner of Thunderbird and 7th Street in north Phoenix, has become my new favorite place for beer. Well, for the eastern European kind, at least. Soup and Sausage has been one of my favorite lunch joints for a while. 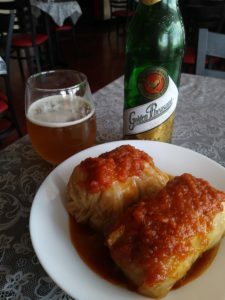 They offer a hearty mix of eastern European dishes--cabbage rolls, pierogi, borscht (yes...borscht!) --all of which is to die for. 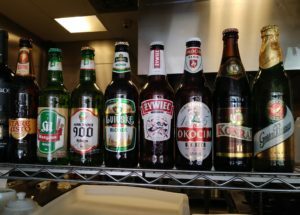 But only recently have I taken notice of their beer menu--an eclectic mix of Ukrainian, Polish, and Czech brews. Foreign beer is often notoriously difficult to acquire here in Arizona. Distribution rules and contracts limit the unique beers one can find, even at a big box store with lots of international shipping "pull" such as Total Wine. But Soup and Sausage, miraculously, stocks beers I have never seen before and would love to get my hands on. On a recent visit, I noted they were offering Zywiec Lager as well as Golden Pheasant, both of which I've had before. But they also offered Okocim OK, Konrad 11 and Mikulin 900. Most of Soup and Sausage's beer selections are standard International Lagers, which may not be the most "it" style right now, but the diverse breweries represented give me another outlet for working on those Untappd badges! I gotta get to work on the "Budmo/Ukraine" badge! Whoo! If you visit, remember...Soup and Sausage is a restaurant, not a package store. Beers must be consumed on the premises. That's OK...the food is so good, you won't mind lingering.